The Tigers claimed the Mark Gaskell Shield for the sixth year running to cap off a successful round against archrivals Wynnum-Manly. First grade posted an imposing 8/322 declared in the first innings of their two-day clash on Peter Burge Oval, but could only manage a draw. The Tigers bowlers were unable to take the final three wickets required to earn first innings points as the opposition went to stumps 7 down for 276. The stand out performers with the bat were Liam Smith (127*) and Charles Mailli (84), while with the ball Josh Arnold, Hassan Sardar and Charles Mailli claimed two wickets apiece. Second grade earned a tight victory on the road thanks to the efforts of Stuey Edgar (66) and Michael McEwan (46), who helped the Tigers surpass Wynnum’s first innings total of 219 nine wickets down. Lenny Watt (4 wickets), Craig Weier (3 wickets) and Jack Sinfield (1 wicket) were the key performers with the ball. Third grade were dismissed for 121 in pursuit of 249. Trent Conwell and Josh Fraser top scored with 34 and 27 respectively. Fourth grade enjoyed a ten-wicket win on home soil after dismissing the opposition for 177 early on the second day. Alex Ward continued his impressive early season form to claim six wickets before Stephan Muller (111*) and Jack Fraser (52*) chased down the opposition’s total without breaking a sweat. Fifth grade continued the Tigers exceptional weekend with victory over University of Queensland away from home. Requiring 199 for victory, Redlands chased the runs six wickets down thanks to a half-century from skipper Michael Moss and valuable cameos from Damyn Waddups (40) and Henry Long (27). Sixth grade one’s game against Wynnum went down to the wire on Ron Field Oval. The Tigers declared early on day two after Will Read (50) and Chandeep Kamra (42) pushed the Tigers’ total up to 271. The visitors set about chasing down the total from the outset, but they quickly shut up shop as wickets began to fall. Pat Cummins (4/25) and Jack Robinson (2/62) took the Tigers to the brink of victory, but Wynnum held on until stumps with two wickets in the shed. Sixth grade two crushed Sandgate-Redcliffe on the road to continue their stellar start to the season. Ben Thompson starred with the ball, claiming six wickets as the Tigers dismissed the home side for 155. Redlands’ chase looked shaky at 6/97, but a century to stalwart Wes Aspeling and a half-century to Reuben Burger ensured the Tigers earned first innings points. Sixth grade three returned after the bye with victory over the North Spartans. After winning the toss and electing to bat first, the Tigers could manage just 116. But the bowlers ensured that would be enough, as they dismissed the Spartans for 101 inside 29 overs. Greg Thompson (35) and Keegan McLean (26) top scored with the bat, while with the ball Ed Little (5/20) and Ethan Raymond (4/11) did the damage. The Lord’s Taverners side wrapped up the regular season with victory over Wide Bay. The Tigers posted 7/273 batting first before dismissing the home side for a paltry 157 to gain a bonus point. Jack Sinfield once again top scored for Redlands with a quickfire 93 and was ably supported by Keegan McClean, whose late order cameo of 63 from 42 balls ensured the Tigers posted a formidable total. Josh Smith went past 20 wickets for the tournament with a four wicket haul in the Tigers’ bowling innings to help his side secure victory. The Tigers ladies were also in fine form with the ball during the first of two twenty-twenty games played on Sunday at Tigerland. Redlands dismissed South Brisbane for just 34 in the first game of the day before chasing the runs inside 11 overs. 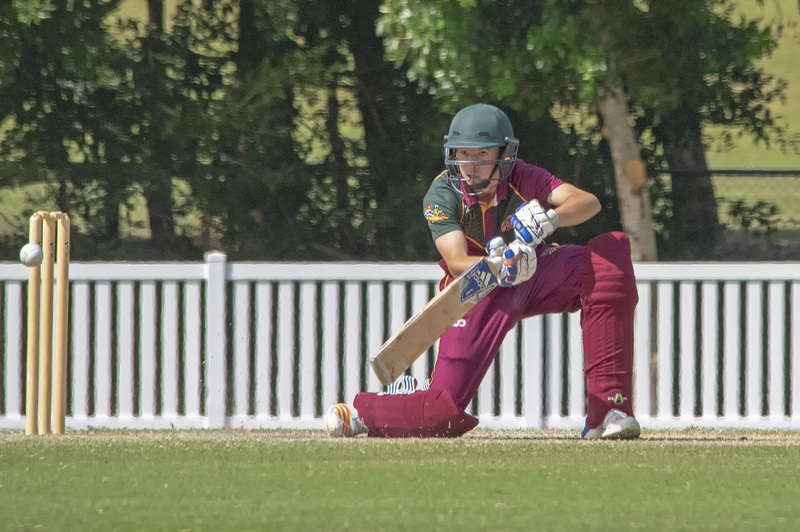 Jesica Pang (3/6) was the stand out with the ball, while with the bat Denise Sanders (13*) and skipper Delyse Laycock (15*) saw the Tigers through to a triumphant victory.